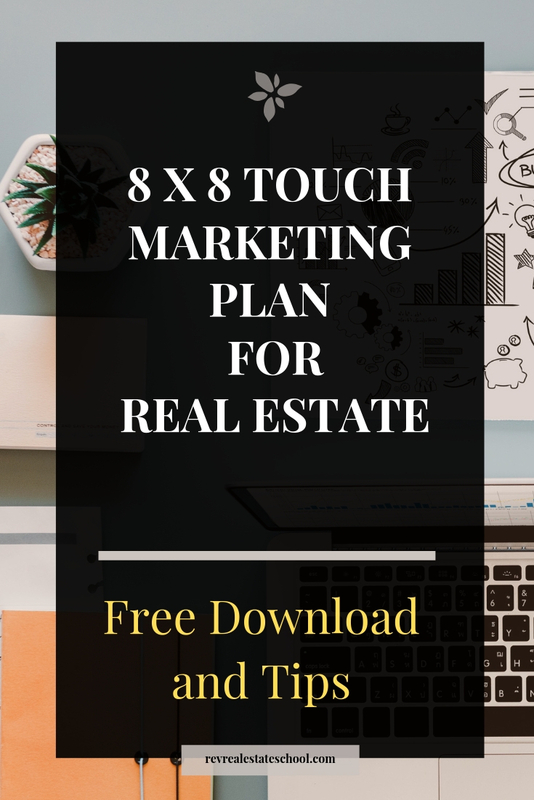 In real estate, the 8x8 and 33 touch campaigns are used to stay in touch with people in your database. You can use these strategies together. The 8x8 campaign is used when you meet a new person who is entering your database or when someone in your database shows interest in selling or buying. The 33-touch campaign is used to stay in touch with your database throughout the year. These campaigns originated from Gary Keller and The Millionaire Real Estate Agent. What is the 8 x 8 campaign in real estate? The 8 x 8 campaign is a systematic way of establishing relationships and strengthening ties with prospects and leads. This is used when a new client enters your ecosystem or a lead is converted into a client. Once a week for eight weeks you will make a meaningful contact. 8 touches over the course of 8 weeks. Week 1: Intro Email/Text/Call - Anything I can do? Can I stay in touch? The first week is a quick email, text, or call where you a just touching base to see if they need anything right off the bat. If you have just met this person, you may just be following up. Make sure you ask if there is anything you can do and ask if you can stay in touch. The reason you ask these two questions is you want them to know you are here if they need anything. Furthermore, you want to as if you can stay in touch because you will be touching base over the next 8 weeks. On week 2, you can send them a video text or email using a service like BombBomb or Loom (or even your phone). This a great way to touch base and do so in a unique way. The content is just “touching base” and wishing them a great week. If they are a buyer or seller then you can include a buyer’s or seller’s guide this week. Week 3 is always a social media connection. If you have not added them on social media, you can do so this week or if you already have them on social media, add them on another channel. Choose your channel appropriately. If it is a professional connection, you may want to start with LinkedIn or Twitter. If you already have the person of social media, comment on one of their posts this week! On week 4, you have been in touch with them for one month. If you do a monthly market report for your community then by week 4, you should have a recent market report. Even if it is a few weeks old, it is worth sending. The last week was more of a personal approach (social media), so this week is focused on more of a professional approach. If you are dealing with a prospective buyer, then a market report is perfect. If you are working with a prospective seller, then a community report with recent sales is preferable. This week, you can call or text and ask if they have any questions about what is happening in the real estate market. The last week they received your market report, so this week is a quick conversation or text to see if they have any questions. You can also ask them if there is anything you can do for them this week. On week 6, you spoil them! You send them a handwritten card with an item of value. The item of value is can just be a simple free coffee from a local shop or a note pad. Don’t overspend or overcomplicate here. Just something small. If you have their home address, send the card to them at home, however, if you don’t have their home address, you can always send it to them at work. Week 7 is an information week. Last week was a fun item in the mail so this week you just send them a more informational item. You can include a recent blog post, news article, and/or closing cost guide. Week 8: Video (Text/Email) Anything I can do? You made it! Week 8 is another video text or email where you ask them if there is anything you can do. It’s a simple message where you simply let them know you are always here if they need anything. By week 8, the prospective buyer or seller will know that you are a professional real estate agent and you will be solidified in their mind as THEIR real estate agent. [00:00:11] Hello and welcome back to Rev Real Estate School. My name is Michael Montgomery. Today we are talking about the buyer eight by eight marketing campaign. This is such a powerful way that you can connect with buyers that are in your database. Tomorrow we're talking about the seller 8 by 8 campaign. And then finally we're going to finish off with the 33 touch. So what are these campaigns if you have not heard of them. They come directly from Gary Keller's Millionaire Real Estate Agent book. If you haven't read that book it's like the Bible for a lot of real estate agents. It is unbelievably good and in there he brings attention to these concepts. [00:00:48] The 8 x 8 concept and the 33 touch concept with the eight by eight that were first going to go over. These are used when a new client enters your ecosystem a lead or a prospect or somebody you know just enters into your real estate ecosystem and the way that I usually started is when anybody mentions that they are looking to buy or sell or there's any mention of that within the next foreseeable future then I would put them on what we call the 8 x 8. So how it works is once a week for eight weeks you will make a meaningful contact with those people. Now you will notice the key word in there is meaningful you don't want to be sending the junk you don't want to be sending these people items and information that it's just forgettable or something that they would just throw away. So you want to make sure that you're strategic with what you're sending them. [00:01:39] That's exactly why we're going through just the buyer 8 x 8 guide today and then we'll go through these seller a buy a guide to moral because these are two different types of transaction and we need to treat the people like that as well we need to provide them with meaningful information. If you're just sending them junk over the course of these eight weeks you are honestly going to lose them or you're going to frustrate them because they're just getting stuff that just total junk. [00:02:07] So let's talk about what my eight by eight platform is and then how you can start to implement this into your business for this episode. Head to these show notes because you can download our buyer and seller a by a guides as well as the 33 touch. So this is the freebie for this episode you'll see directly in these guides that what we're after are these meaningful touches. And when we are providing them with content or information we want it to do three things. One of three things that is we wanted to educate entertain or inform. And if you've done anything with content marketing in the past you've probably heard this before that when you're putting out a blog post or anything that's related to content you wanted to do one of those three things educate entertain and inform. So here's the thing and here's one of the issues that I've seen with other eight by eight campaigns is they're not necessarily hitting on one of these three things. They can be way too 'agent focused'. So here are my reviews or just plain useless information that isn't just taking up space and we don't want to do that. We don't want to be in this world we don't necessarily want to just provide them with junk that they can throw away or make it about us because it's not really about us. The second problem that I see with 8 x 8 campaigns is it's very simple actually: agents just quit. And it's usually about after two weeks their first week they're all excited ready to rock and roll with it. And then after the second week they're kind of like OK I don't want to be too pushy maybe I'll just skip a week it's OK. I've done that I've been in that position. What you need to do is make them strategic and systematized you want to take all of the thinking out of it systems systems systems so you know exactly what they're going to get. Each single week whether they're a buyer or seller or both for that matter. So let's jump in first off like we said off the start when do you put the person on an 8 by 8 campaign so they're going to be receiving something every single week for the next eight weeks or two months. Anytime somebody mentions real estate to me and they're interested in buying or selling it doesn't have to be in a timeframe as long as that comes up boom they are going on the eight by eight the eight by eight really solidifies that relationship. So I don't want to be afraid of putting somebody on an eight by eight for fear that they might not want to buy in the next six months to a year. That's not the point of it. The point of it is to solidify a relationship. Therefore if somebody mentions real estate I will put them on the eight by eight and start working through it. So again make sure you're going to show not so you can download this and then you can tweak it to your own specification. This is the one that works perfectly for me. But feel free to do what you'd like with it but your own personality on it put your own type of business practice on it. But make sure that you have the system and you have a strategy behind it. [00:04:57] So week number one let's jump right in. The first thing they're going to get. So if I've met them at a party or an event or something like that I'll follow up with an email or text or call right. You're doing a follow up after you've met somebody or you've chatted with them about real estate and what I'm going to do in that email text or call as I'm just simply going to ask is there anything I can do for you. And the answer to that's probably not. It's totally low pressure you're just putting that out there you're saying is there anything I can do for you right now. Because they're looking to buy or sell right now than you probably want to know that. If the answer is no which it usually is it's just a quick low pressure hey is there anything I can do for you right now. And the answer is no you know not right now but maybe in the future. And then I follow that up with awesome cool. Is do you mind if I stay in touch. Is it okay if I stay in touch and that way that's all I'm doing on week 1 is I'm just letting them know that I'll be in touch with them over the course the next few weeks and then as we start to move through these weeks you'll see that they are pretty low pressure. There's nothing related to do you want to buy or sell real estate. There's nothing in the 8 by 8 campaign that relates to that. It's information focused it's strategic and it's a value add value add. [00:06:04] So week number two they've received that and then week number two I'm jumping into a video. So that's either coming in the form of a text or an email if you want you can of course use BombBomb. Just use the camera on your phone if you're sending a text or if you want a free service UseLoom . That one is a amazing so week two I'm just sending them a video saying Hi how are you. That sort of thing and then I'm attaching a buyer's guide so I want them to have a lot of value right off the bat there. I want them to see the buyer's guide and then also get a video connecting with me again. [00:06:37] Week number three. Everyone has social media accounts and week number three I will add them on a social media account. Now you have to kind of pick and choose here right. Like if you just randomly met somebody at an event and you don't feel like it's the right time to go and throw them a Facebook friend request then that's fine then go LinkedIn. Or follow them on Instagram or Twitter or something like that. But Week Three is always a social ads. So On a social media account whichever one I choose I will add them if I already have them as a friend on my social media accounts. Then I might comment on one of their posts or send them a quick message but more often than not week 3 is just focused around some social media sort of touch. [00:07:18] Week number four they get a market report. So if you're on week number four chances are you've gone through one month and if you're doing a monthly market report for your database then you probably have one ready to go. So that's why on week number four I include a market report whether that be a link to a blog post or just your city stats or whatever you want to send. It's just a general market report for your city or community or whatever you would like. [00:07:43] Week number five I call or text them ask them if they receive the market report and just see if they had any questions. Just have a general very very low pressure conversation. Hey did you receive the market report. Any questions? Is There anything else I can do for you today. So you're coming back to that question from week 1. Is there anything I can do for you. And you're always just coming from this place of how can I be of service. Even if they never buy or sell through you you still want to be that person of service to them that will pay dividends for years and years and years down the road. [00:08:16] Week number six is a handwritten card plus an item of value. But here's the thing. If they're buying you may not know where they live. Right now you may not have their home address which is fine so I'll send it to their work. You can send to their home or their work and it's just a handwritten card. The item of value that I'm including in the card. I mean it can be as simple as say like a notepad or something like that or just a small Starbucks card. You're just sending them a handwritten note and then you also have something of value within that note. I'd highly recommend just doing very inexpensive coffee gift cards or just a notepad. If you have that. [00:08:51] Week number seven this is the week for info item. So when week number seven usually in the form of an email they're going to get a recent news article or blog post and or my closing cost guide so week number seven is focused more around very information heavy. The last few weeks were handwritten card. So those are a little bit more on the entertaining side so than week number seven we're moving more into the information side. So I want an info item on week 7 news articles you can share anything even if it's a news article from your city. I'd highly recommend sharing one of your recent blog posts and then a closing costs guide can be very very useful as well. [00:09:35] Finally we're moving on to week number eight. So you've been in contact with them every single week for the last two months. Week number eight is a video text or email. So one more final video text or email just asking them again. That one question Is there anything I can do for you. And if the answer is No. Awesome. No worries whatsoever. From there they moved down onto the 33 touch program. [00:09:59] So there you have it. That is the buyer 8 by 8 campaign. And remember it's not really about what you're sending them what you're sending them is important. And make sure that it's not very you focused. Make sure that it's them focused or market focused. But it's more about just making sure that you stay in contact. Most agents will fall off the wagon after two or three weeks. So you have a huge advantage here if you're just able to stick with it and you can always follow up your messages with something that we call basically the out and the out is always following up a message with a no need to respond. Right? So if you feel like what you're saying is Oh I just message them last week I don't feel like I want to send them something else. No worries. Still send them something because it's just part of your system. But follow it up with hey no need to respond. I just want to send you a quick market report so you know what's happening in X city. Very very simple. [00:10:52] Thank you very much for listening to this episode. Tomorrow we are jumping into the cellar eight by eight and then the 33 touch program. And if you want a quick business reset you want to ask a top producer anything. Remember you can always get 100 percent free coaching with Rev real estate school nothing to sell it's just sit down have a conversation over the phone with a top producer and ask any question you would like. Very simple to do this. All you have to do is write and review these show. We will give you a shout out on the show and head over to rev real estate school dot com to book it in. Thank you very much and we'll see you on the next lesson. [00:00:11] Hello and welcome back to another episode of Rev Real Estate School. My Name is Michael Montgomery. Today we are talking all about the seller eight by eight. So if you heard yesterday's episode we were talking about the buyer eight by eight marketing campaign. Today we are talking about a modern spin on the seller eight by eight marketing campaign. So these eight by eight they come from Gary Keller's book the Millionaire Real Estate Agent the most amazing book out there. If you are looking for systems in real estate and we should all be using systems within our business the 8 by 8 campaign is there to help establish a relationship with a potential lead client or rekindle a relationship with somebody in your database. Now the seller eight by eight is similar to the buyer eight by eight and quite a few ways. But there are some differences and that's because the person has a different need. So we want to tailor it as much as possible. The more that we can tailor in real estate to the client the better. But we also have to keep that balance between tailoring but also making sure that we have time and systems behind things if we tailor everything to a very personal approach then we might not have any time in order to go out there and build new connections. So we do want to have that balance. If somebody is showing signs of selling I don't want them to get a buyer's guide even with my market reports you'll see I want them to be a lot more community focused and sales in their community focus. [00:01:39] I don't want it to be as general now as a reminder of the eight by eight it's eight reach outs eight touches over the course of eight weeks or two months of staying in touch with somebody on a personal level in order to solidify that relationship with them. Now the main problem as we know it's the same thing with the sellers as it was for the buyers the main problem is it can be too Agent focused. We can be sending people our listings we can be sending people are reviews don't make it about you make it about them and make it about the market. The second problem same thing is with the buyers. Most agents will throw in the towel after two weeks. They don't want to be pushy they want to be sales. They want to be any of these things. So they just give up. Make your eight by eight a campaign that you want to send people over the course of eight weeks. It does not have to be pushy and nor should it be pushy. If you use our structured campaign it's all coming from a place of Here's the information here's what's happening in the market. So let's jump into it and remember for this one as well you can go to the show notes you can download the freebie for this episode which is the buyer and seller 8 by a guide as well as the 33 touch guide which we will get into on tomorrow's episode. So week number one week number one is the same as with the buyers. It is an intro e-mail text or call with that line that you will see throughout here. Is there anything I can do for you then following it up with can I stay in touch. [00:03:08] So how does this look. You met somebody at an event or somebody in your database says you know what I might be looking to buy with the next little while. Great. You put them on to the 8 by 8 campaign and here's what you do is when they say that your first week is there anything I can do for you what you're doing here is you want to know right off the bat is there anything that they need right at this point in time. If the answer is yes you want to jump into high gear and get to work. If the answer is no which typically it's not typically they need a little bit of time. Real estate isn't this overnight sort of thing. Then we want to ask them Can we stay in touch and what we're doing is we are letting them know that over the course the next little while. Yeah we're gonna be in touch and that's because we believe strongly in our ability to sell real estate and we are also dedicated to following up. [00:03:55] Week number two you're sending a video text or e-mail and this is the same as the buyers but you're doing it with a sellers guide this time around. So obviously you're not conclude a buyers guide you're going to still send that video text or email you can use BombBomb use your phone if you're sending a text or you can use UseLoom attach the sellers guide. [00:04:20] Week number three is always our Social Media Week. So here we are adding that person on social media or we are adding them on a different social media platform if already Facebook friends and maybe we're doing a LinkedIn request or something like that. And if we already have them on everything then we're commenting on one of their posts week three is always social media focused. [00:04:41] Week four so week four we've gone through one month we very likely have that market report for the month for your city. Here I am sending them a market report over email but I also want to include a community report a breakdown of recent sales over the last month in their community. They will very much appreciate this and if they're going to sell. Chances are they're watching the market like a hawk. So they're seeing these new ones come up but they're not necessarily seeing what places are selling for. So we for is a community report. Recent sales and then a market report. [00:05:15] Moving right along to week number five the call or text. So you're calling or text them asking them did they receive it. Did they have any questions. Is there anything you can do for them. Week number five. Very very easy. [00:05:27] Week number six is the handwritten card and item of value. So again you can send it to their home. You can send to their work but if they're selling you probably know where they live. So if you can send to their house do that. And with the handwritten card you are adding an item of value. So this is a free coffee card a notepad something simple that you can put in the mail to them. [00:05:50] Week number seven is our info item week. So again we can send them a news article or blog post on what's happening in the market. And then seller closing cost guide. This doesn't have to be complex it can even be an email with. Here are some general costs to keep in mind when you are selling so week seven is always info item because week six was on the entertained side which was a handwritten card and an item of value. [00:06:16] Finally week number eight of the seller eight by eight. Again you are sending a video text or email and you are asking that same question Is there anything I can do for you today regardless of what that answer is you then move them on into the 33 touch and because you've kept such close contact with them over the course of the last two months you have solidified yourself as their real estate agent when the time comes. So there you have it. [00:06:45] Tomorrow we are going to chat about the 33 touch program. Remember if you want a quick business reset and you want to ask a top producer anything anything in the world you can always get 100 percent free coaching with Rev real estate school. All you have to do is write and review the show head over to rev real estate school dot com and from there you provide your information and a top producer gives you a call you can ask them anything in the world. 100 percent free. Nothing to sell. Just a great conversation. Thank you very much for listening to this episode. [00:07:15] We will catch you in the next lesson this episode of Rev Real Estate School has come to a close. Thank you for tuning in. We'll see you back here for the next lesson.